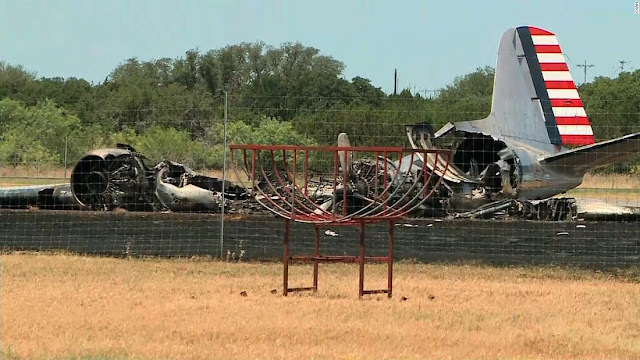 Thirteen people survived a plane crash at the Burnet Municipal Airport on Saturday morning. The Burnet County Sheriff's Office said they received a call about the crash around 9:00 a.m. 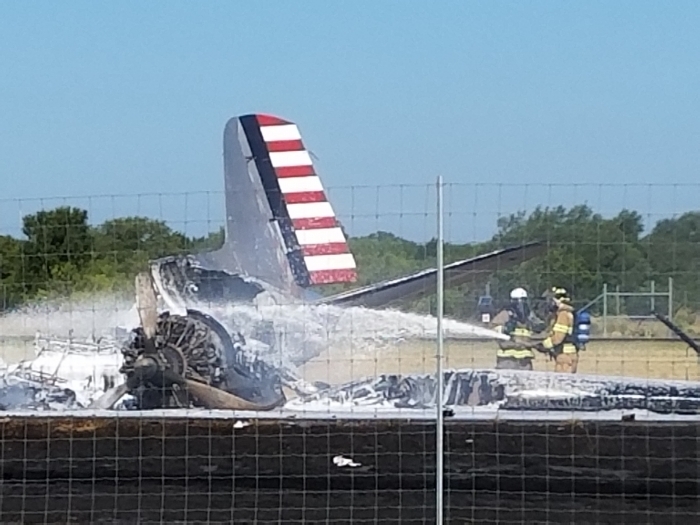 The plane, a C-47 vintage plane called the "Bluebonnet Belle," crashed during take off, according to the Commemorative Air Force. The Commemorative Air Force own the plane, which was heading to Oshkosh Wisconsin for an airshow. All 13 people on board were able to exit the aircraft, according to the Burnet County Sheriff's Office. One person was airlifted by helicopter to with significant burn injuries to the San Antonio burn unit, according to a spokesperson with the Commemorative Air Force. The aircraft caught on fire and ignited nearby grass. Firefighters were able to extinguish the fire. The National Transportation Safety Board and Federal Aviation Administration will investigate the accident. The famed Bluebonnet Belle C47 Skytrain, which assisted in Hurricane Harvey relief efforts and was an integral part of the Highland Lakes Squadron of the Commemorative Air Force, crashed Saturday morning, July 21, at Burnet Municipal Airport's Kate Craddock Field in Burnet while attempting to take off for an air show in Wisconsin. The crash is under investigation by the National Transportation Safety Board and the Federal Aviation Administration, which had agents on the ground interviewing passengers Saturday morning. Do not see any elevator movement in the video and the elevator is neutral in the stills. Someone forget the control lock? Another museum pilot destroys another piece of history. It's becoming a common theme. Amazing everyone was able to get out before the fire. 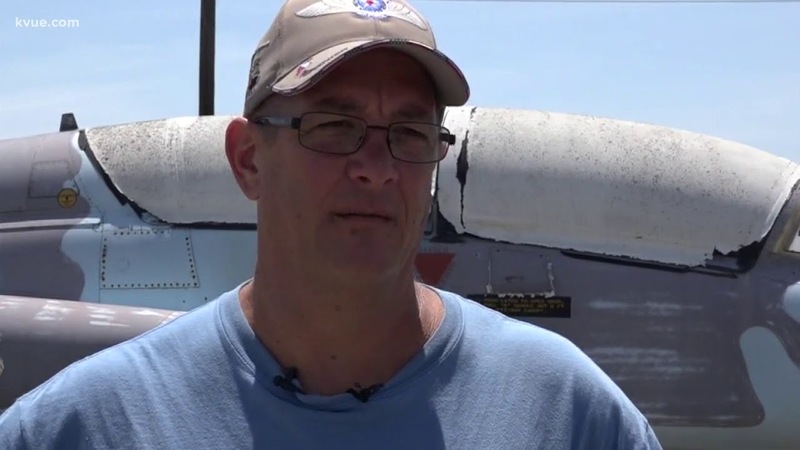 The video seems to show that something was just not right about the takeoff roll. It’s possible the right engine wasn’t developing, or lost, full power. The airplane was probably close to gross weight. It also appeared that the airplane was jerked off the runway rather than slowly lifting off. My opinion for what it's worth... appears they were having directional control issues during the take-off roll. Whether it was due to poor piloting skills, crosswind, an engine surging, or partial power loss I obviously don't know. For whatever reason the plane ran off the left side of the runway into the grass. Normal "instinct" would be to try and pull it off the ground to regain directional control if you're near flying speed (to me they looked slow). In this case it appears that's what the pilot did and being hot and heavily loaded it appears the plane stalled. I did not see any elevator movement during the take-off roll but the ailerons and rudder could be seen moving. If I remember correctly the rudder lock and elevator lock are normally connected to each other by a rope so they would both be removed at the same time but I could be wrong. Two things surprised me... the first was how strong the landing gear must be because it took a while even sliding sideways before what appeared to be a gear collapse. However, it's possible they may have just slid down into a low spot and that's when the big fog of what I presume was fuel sprayed out. Maybe the wing hit the ground and broke open at that point? The second thing is how long it took before the power was pulled back to idle. The plane was sliding sideways before the throttles were pulled back. It's sad to see a plane that's been around 74 years and had the history this one did end up a burned out wreck. I'm just thankful everyone made it out alive and pray for those that were injured. It appears to be a true miracle! Saw a local news story today about this crash. In one of the scenes of the burned out wreckage you can clearly see the horizontal stabilizers are in the "in trail" or neutral position when they would normally be hanging down when the controls are unlocked. You cannot see any external control locks but something is clearly not right with the stabilizers. June 1971 C-47 (DC-3) crashes at Shelter Cove, CA. May 2014 G4 crashes at Bedford, MA. All aboard both planes were killed. Cause, gust locks not removed before takeoff. Looks like it happened again. Fortunately, no one was killed. Come on pilots, check the controls are free and correct. Obviously no Tail Dragger pilots here, classic ground loop caused by loss of directional control. Either the pilot wasn’t on the rudder pedals the way he should be possibly aggravated by a wind gust, or engine power fluctuation. BTW you don’t want the elevator down early in the T/O roll. You want it neutral or slightly up to keep weight on the tail wheel for control. My first thought was gust/control locks not removed, but after looking at the photos and video I don’t think so … just my 2 cents worth. Let’s let the NTSB figure it out, there very good at what they do. I think he lost the number 1 engine (left engine). The aircraft seems to not have been at flying speed upon rotation. If lack of power then the takeoff should have been aborted. Always hindsight. Glad no one perished. I looked at numerous DC-3 crash pics on the internet and most show the elevator in a downward position. With the tension on the cables gone due to the burned out fuselage shouldn't gravity cause the elevator to be deflected down yet it's neutral in the pics of this accident. Something doesn't seem right. I didn't see any flaps down in the video. Someone said, "I didn't see any flaps down in the video." A DC-3 (C-47) does not use flaps on takeoff. Jeez, whom are the letting fly these things!? Another historically important aircraft destroyed by incompetent pilots. The crash video shows a textbook case of poor tail-dragger flying skills. And yes, I have extensive tail-wheel time including DC -3 time. I have to agree with the above comment. If the elevator gust lock was removed before flight, then this was caused by poor tail-dragger flying skills. He never lifted the tail and lost directional control with the rudder causing him to rotate too early in an effort to "save it" only to stall the wing which caused the rocking and contact with the ground. If it wasn't for the post-crash fire, that bird might have been able to be fixed. Hope the injured person will make a full recovery. Having flown a DC-3 for 72 years (yes, I said 72 years) you never force the tail up on take off.